A change of scope is needed for Dunedin’s cycling network, but it is unclear what the DCC’s change in scope actually means, and higher standard cycleways are only part of the story. Spokes Dunedin has a vision for successfully realising the cycle network. We want everyone to be able to cycle from North Dunedin to South Dunedin, out both sides of the Harbour, and through the tunnels to Green Island and Mosgiel on a connected framework of city-spanning arterial routes that are safe, direct, and convenient to use. This will focus work where there is a clear need for improved safety rather than on streets that are already relatively safe, and will create a solid initial network that can grow and develop in response to future demand. The great thing is that there already exists some cycling infrastructure on many of the routes for this initial network. Several things can be achieved by the end of this year that will help Dunedin catch back up to where it should be. Support NZTA to begin construction of the SH1 separated lanes by the end of this year. Fix Portobello Road – it’s already been two years. We don’t need fancy landscaping, we just need the median barrier realignment so the road looks like a road and the cycleway looks like a cycleway. Complete the Wharf/Roberts intersection as agreed – it’s already been two years. This intersection presents an identified safety risk on a high demand route. Continue the SH88 path through the rail corridor to the railway station, thereby providing an alternative to the cycle lanes on Anzac Ave (heavy freight route and high risk). Create a separated cycle lane from the intersection of Andersons Bay/Strathallan, along The Oval, to Crawford Street in place of the existing cycle lane between two lanes of fast-moving traffic. Develop plans for a separated cycle lane on North Road and safety improvements for the Opoho intersection to tie in with NZTA’s forthcoming separated cycle lanes on SH1. This route is of very high strategic priority. Dunedin is a pro-cycling city, where a significant proportion of the population regularly cycles for recreation, transportation, or both. Year after year, cycling is one of the most strongly supported and heavily submitted-on topics in the annual plan. One of the biggest public consultation events in Dunedin history was held in 2013 regarding the proposed SH1 separated cycle lanes. In addition to widespread media coverage, NZTA and DCC staff solicited input from the public at information booths in busy locations including the Golden Center, Toitu, and the University. With over 2000 written submissions and roughly 800 survey responses, the SH1 separated cycle lanes received one of the highest response rates of any topic ever consulted on. The result was overwhelming support for the proposed separated cycle lanes. Independently, the AA undertook a survey of their local membership, with over 70% of the nearly 1500 respondents supporting the proposed separated lanes. The overwhelming public demand and support for better cycling in Dunedin cannot be denied. In response to this demand, the City rightly undertook to develop a Strategic Cycle Network. But the South Dunedin portion of the cycle network has not delivered on the ambitions of the cycle network plan adopted in 2011. Nothing has progressed in the last year, leaving half-finished elements scattered around, with other things ripped out without consultation. Some might argue that we should throw up our hands in despair, abandoning the possibility of future success under the fear of past failures. But others know that setbacks are par for the course when charting new waters and trying new things. Where would we be if the likes of Cook, Columbus, or Magellan had turned around after the first storm and torn sail? Those leaders stayed the course, their sailors gained experience, and they ultimately changed the world. The success of the Portsmouth Drive and SH88 paths demonstrate what is possible and provide confidence that the rest of the cycle network will be successful if done right. The key thing now is to keep moving towards the goal while modifying the delivery strategy to ensure success. Spokes Dunedin has not always agreed with the choices made by the DCC and feels that most of the mistakes stem from bad advice from out of town consultants who were trusted as experienced experts. A change in scope is definitely needed, and the change in scope in this year’s annual plan calling for higher standard cycleways may be part of the solution, but there isn’t really sufficient information provided to know what this actually means, but landscaping is mentioned. Landscaping should not be required for most routes since the cycleway will usually be in the road corridor. Furthermore, we do not believe it is appropriate to fund large-scale city beautification projects out of the very limited cycling budget. Let the cycling money pay for cycleways. Landscaping, planting, and park benches are the domain of parks and recreation, not transport. What Dunedin needs is a winning implementation strategy, and Spokes Dunedin has a vision for how to do it and how to quickly get Dunedin’s cycle network back on track. Most of what is said in this submission has been said by us before but has not been adopted. We think these are common sense recommendations that can be quickly adopted, and we expect to see real on-the-ground progress of the cycle network by the end of this calendar year. The place-based approach employed for South Dunedin hasn’t worked so well. In 2012 we said “although we support the redevelopment of South Dunedin in ways that make it more attractive and accessible to people on foot and on bicycles” we thought it was a mistake “to concentrate all the next three years’ funding on that area” (Spokes Dunedin Long Term Plan submission, May 2012). The place-based approach risks encouraging expenditure on routes with low strategic value and low priority in the name of providing a “complete” subnetwork, rather than tackling the real safety risks encountered by cyclists and the barriers to cycling. A backbone of city-spanning arterial routes that will enable future growth of the network. The most natural overarching structure prioritizes the flat areas from Normanby, through the city, along both sides of the harbour, right through South Dunedin to St Kilda and St Clair, the tunnels/trail to Mosgiel, and Kaikorai Valley Road. Identification and prioritization of safety risks, barriers to cycling, and connectivity issues across the city. This approach is fully in line with the original intent of the cycle network strategy adopted in 2011, which said “the network is designed to provide greater connectivity and safety for cyclists. Identifying strategic routes means investment can be targeted to achieve the greatest benefit. Development of cycle facilities on the routes (such as cycle lanes, separated cycle paths, or shared paths) will be carried out over a 20 – 30 year period, based on priority.” Since our proposed approach seems to be the true intent of the network, we expect that it can be immediately adopted to achieve on-the-ground results by the end of this year. The great thing about this strategy is that several of the elements are either already in place or already in progress e.g. SH88, Portsmouth Drive, Peninsula road widening project. However, the connections between these existing elements are disjointed or non-existent, and often present safety risks to cyclists or barriers to cycling that need to be addressed to create a real network. For example, the North/Opoho intersection presents a disconnection between the existing cycle lanes on North Rd (which should be converted to separated lanes) and the cycle lanes on SH1, and creates a safety risk and barrier to cycling. North Road is essentially flat, is the obvious way into town for about 9,000 people, and is the designated sealed cycle route to points north of Dunedin (which also sees heavy use by recreational cyclists); connecting North East Valley to the rest of the city via North Rd is clearly of high strategic value and should be a top priority.. At the other end of SH1, the northbound cycle lane from Anderson’s Bay Rd along The Oval is between two lanes of fast-moving cars and trucks – another clear safety risk and barrier to cycling that could easily be mitigated by a separated cycle lane along The Oval. A list of routes that should be completed by the end of 2016 is given in the summary above and in the conclusions below. Front loads larger, higher capital projects to maximize Urban Cycling Fund (UCF) and higher Funding Assistance Rate (FAR). Enables faster user uptake by opening access to more of the city more quickly. Allows dynamic growth of the network over time in response to evolving usage patterns. Mitigates risk of progress on the network stalling at a point where there is still limited coverage. The backbone approach has demonstrated the most success around the world, most recently in Auckland, by enabling people to get from the places where they live to the places where they work and study. It is also better from a public perception standpoint: the reason people support the SH1 separated lanes is because they are a common sense solution to an obvious safety risk. Mitigate the safety risks for cyclists. Encourage increased uptake of cycling for both transportation and recreation. Number 2 will be a natural outcome of doing number 1 correctly but the DCC’s approach has been to focus solely on number 2. Sadly, the “interested but concerned” or “potential cyclists” have been invoked to justify flawed infrastructure, notably in South Dunedin. We have previously said “the ideal scenario for a truly strategic cycle network is segregated cycle lanes” (Spokes Dunedin submission on South Dunedin Regeneration Scheme 13/12/2011) and “with limited initial funding, we would prefer to see fewer routes done to a higher standard than many routes done to a lower standard” (ibid). However, we have also said many times that separated cycleways are not necessary or appropriate in every situation; rather “the appropriate location for SBFs is along the busier, higher speed roads that constitute the direct routes for cyclists” (Spokes Dunedin submission on South Dunedin Strategic Cycle Network Package 2, October 2013). For example, the bidirectional SBF installed on Gordon Street is a beautiful, very high standard cycleway, but is on a small street with very low traffic volumes and very low speeds that most people have never even heard of. As we have said before “placing cycle routes on little-used, inconvenient back streets is likely to create little-used, inconvenient cycling routes” (Spokes Dunedin submission on Second Generation District Plan March 2013). Thus, while the change in scope to higher standard cycleways sounds like it is on the right track, it will only succeed if those higher standard cycleways are on the right routes and if other complementary approaches are taken on less busy, lower speed routes. A standard of cycling infrastructure that is appropriate for the location and environment. Concomitant with the backbone approach and identified priorities and safety risks, the initial development of the cycling network will typically focus on high standard separated cycle lanes on busier, higher speed roads that constitute direct routes for cyclists. Cycling infrastructure that works for ALL cyclists; because building cycling infrastructure with the expectation that large numbers of existing cyclists won’t use it is a strategy for failure. Spokes Dunedin, Inc. is a highly credible organization whose aim is to represent the interests of cycling in the urban environment, and we regularly liaise with the varied elements of the large cycling community in Dunedin to inform our position, including the bike shops, Cycling Otago, Mountain Biking Otago, Otago Mountain Bikers – Social Riders, Dunedin BMX, Dunedin Triathlon, and individual cyclists. The Draft Annual Plan “change in scope” calls for asking people what they think earlier in the process and testing designs with community stakeholders, which sounds great on the surface. But this Draft Annual Plan itself seems to be nothing more than the status quo. Here we have a change in scope for the city’s cycling ambitions that hasn’t even been discussed with Dunedin’s cycling advocacy organization to ensure we’d be on board when it goes to public consultation. It seems bizarre the DCC would put anything out for public consultation on cycling without knowing in advance they had the full support of Spokes Dunedin. We have provided prescient and critical knowledge and opinions which, had they been heeded, would have averted many of the problems plaguing the Strategic Cycle Network delivery. For example, in July 2011 we called for separated cycle lanes on SH1 and predicted the exact location and manner of Chris He’s death more than a year before it happened (Spokes Dunedin submission on DCC Strategic Cycle Network, 15/7/2011). 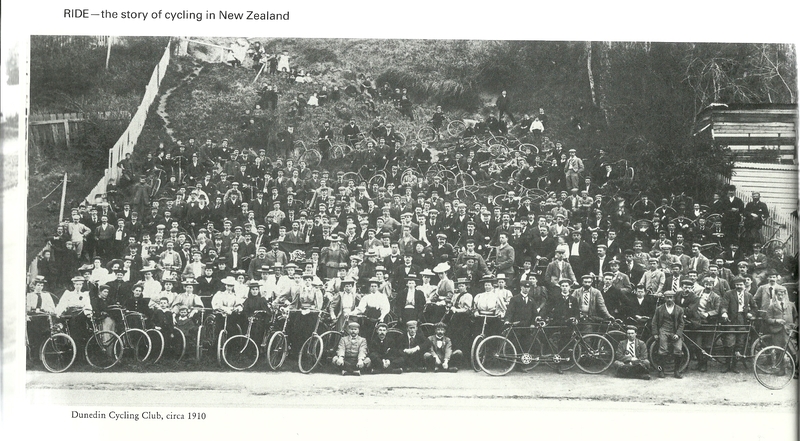 In 2013 we, along with a large number of other individual submitters, opposed the reliance on Quiet Streets in South Dunedin, saying “Dunedin should take to heart the experience of other cities that abandoned the ‘sending bikes on back streets’ idea in favour of separated lanes” (ibid), only to be ignored. And on 6 May 2015, we contacted DCC staff to convey our alarm at what was being installed in South Dunedin, calling for a halt to construction until intersection treatments could be reviewed, only to be told “the intention of the design is not as you assume. This facility is physically separated from motorised traffic which is a safe outcome for ‘Interested But Concerned’ cyclists at intersections,” as if Spokes Dunedin didn’t know what we were talking about. Construction was halted after it received criticism in the Otago Daily Times and the cycleways liaison group toured the project to assess the situation. Ongoing, real-time, on-the-ground stakeholder engagement at every stage of a project. Close contact with Spokes Dunedin on anything related to urban cycling in Dunedin, including changes of scope and identifying a successful delivery strategy. A monthly written update on all work relating to cycling for Spokes and other cycling stakeholders to circulate through their networks. As an example of the successful approach to constructive engagement: in mid 2014, Spokes and AA representatives worked closely with DCC transport staff to find a revised solution for Portobello Rd (Portsmouth Dr to Andersons Bay Rd). This revised solution was presented in February 2015 and was agreeable to Spokes, the AA, property and business owners, and the public. Yet more than a year later nothing has happened. This is similar to the situation at the intersection of Wharf/Roberts, where a working group established in December 2013 came up with a solution that was agreeable to Spokes, AA, police, fire service, St. Johns, and property and business owners; yet nothing has been implemented in the two years since. Timely implementation of agreed solutions. The DCC Transport Planning team has gained significant cycling experience over the past three years. This is new ground not only for Dunedin but for all of NZ, and staff have been developing working relationships with key stakeholders such as Spokes and the AA, as well as beginning to value and obtain community feedback and buy-in. On the other hand, there seems to be a disconnect between planning and implementation, where what was put on the ground did not always coincide with what was planned, as seems to have been the case for Portobello Rd. The situation at the DCC also seems to have deteriorated over the past year. Transport planning staff appear to be disengaged at meetings, we have fairly limited contact with staff outside of cycleway liaison group meetings (the last cycleway liaison group meeting was 5 months ago), and we aren’t even sure which staff are now actually working on cycling. This cannot continue. Existing staff working on cycling infrastructure need to be supported to upskill and build key relationships. Investment in DCC transport staff capacity, through both training and upskilling of existing staff (working trips to Auckland, Melbourne, Denmark, etc), and through recruitment of a senior cycling ‘tsar’. Support staff to develop a clear, consistent, time-efficient approach to working with key stakeholders; and an approach to the wider community that encourages informed input. Strong links between the planning and operational sides to ensure they are working together to achieve the goals set forth by the Council. New health and safety legislation has just come into effect that reinstates personal liability for those with a duty of care who fail to mitigate identified safety risks. Although this new law appears to be primarily focused on workplaces, we believe the City Council and the Crown have a duty of care towards citizens in public spaces. In the new workplace health and safety legislation, employers and Crown agencies can be held liable if harm occurs during the course of reasonably expected behaviour that results from a previously identified but unmitigated safety risk. In July 2011, Spokes Dunedin wrote “Spokes would prefer to see some kind of physical barrier between cars and cyclists where cycle lanes are deployed, and we express here a strong preference for Separated Cycle Lanes over Cycle Lanes. Where cycle lanes currently exist, particularly on those routes that experience heavy industrial large vehicle traffic, cyclists are often put in dangerous situations…..On some of the existing on-road cycle lanes in Dunedin, parking cars are a serious hazard for cyclists, for example outside the hospital on Cumberland Street where a cyclist on the cycle lane faces doors opening into the cycle lane on one side and lorries driving right on the edge of a very narrow cycle lane on the other” (Spokes Dunedin submission on DCC Strategic Cycle Network, 15/7/2011). Regardless of whatever designation one wishes to assign to the one-way pair through Dunedin, they are, in practice and common use, mixed-use city streets that are in fact largely residential in nature. Thus there exists a reasonable expectation that people will be cycling on these streets. The death of Chris He on the exact section of road and in the exact manner of death identified as a clear and present safety risk by Spokes Dunedin over one year earlier (along with a recommended strategy for risk mitigation), leads us to the opinion that the Dunedin City Council and the New Zealand Transport Agency were remiss in their duty of care to mitigate identified safety risks; in this case leading to the wrongful death of Chris He. Thus far, risk mitigation does not seem to have featured very prominently in the City’s cycle network delivery strategy. This is a big mistake with potentially serious future legal consequences. As part of our winning strategy, we have placed risk mitigation as a top priority, and we strongly advise the Council to do the same. A few years ago, Dunedin was at the forefront of cycling infrastructure in New Zealand but is now quickly falling behind. Many other cities having already delivered projects that received funding through the Urban Cycleways Fund just last year while Dunedin is at risk of losing out on the funding it was awarded through the UCF because it can’t, or won’t, deliver. Dunedin, like just about every other vibrant city in the modern world, has recognized the importance of cycling as part of the transportation mix, but needs a winning strategy to deliver its cycle network. We have outlined a winning strategy that is based on a city-spanning backbone of connected, safe, and convenient separated cycle lanes on direct routes; that are functional and useful for all cyclists; and which will form an initial framework for future growth in response to demand. The great thing is that there already exists some cycling infrastructure on many of the routes for this initial network. There are several elements that can be achieved by the end of this year that will help Dunedin catch back up to where it should be. We look forward to working with the Dunedin City Council to develop a real cycle network for Dunedin. This entry was posted in Action call, All SPOKESd up, Economics, Infrastructure, Policy, Safety. Bookmark the permalink.